Beulah Stevenson was born in 1895 in Brooklyn Heights, New York, where she lived and worked until her death. She studied at Pratt Institute, the Art Student's League with John Sloan, and in Provincetown with Hans Hoffman. 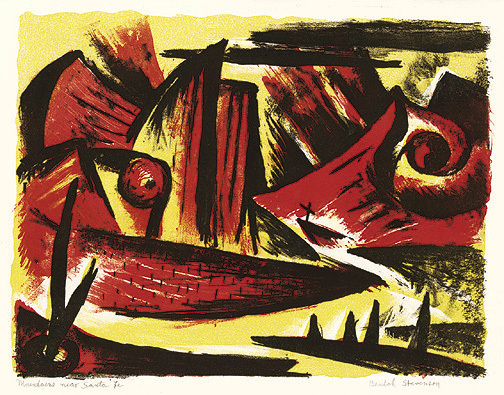 Stevenson was a printmaker, painter, illustrator, teacher, as well as a curator at the Brooklyn Museum. 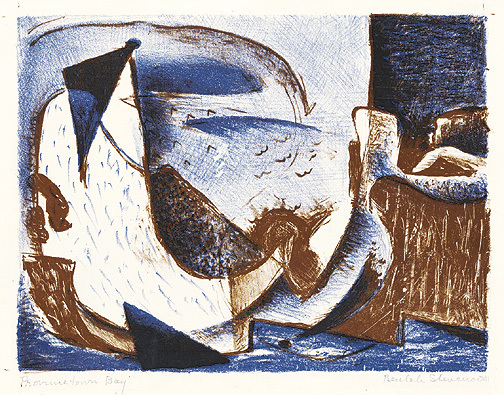 She maintained active membership in a range of artist's organizations including the New York Society of Woman Artists (president), National Association of Women Artists (board member from 1949), Brooklyn Society of Artists (vice-president), Art Institute of Chicago, International Graphic Society Inc., Philadelphia Print Club, Provincetown Art Association and the Creative Artist's Association. She was a member of the American Artist Congress which endorsed government support of art unions and promoted the social-realist style of American scene painting. When the Congress' affiliation with the Communist Party increased, Stevenson left it to join the Federation of Modern Painters and Sculptors, established to promote avant-garde art. America," "Who Was Who in the East," "Who Was Who in American Art," and "Who Was Who in American Women." Her work is included in numerous museum and public collections including the New York Public Library, the Brooklyn Museum and the Library of Congress. Stevenson's dynamic oeuvre embraced diverse subject matter including views of Manhattan and Brooklyn, the Santa Fe landscape, rural landscapes and genre scenes, as well as the abstract and modernist images of her later work. 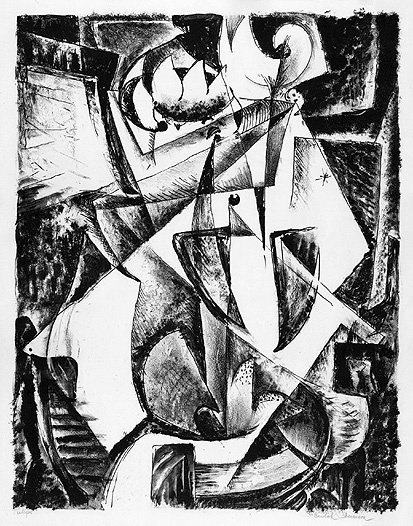 According to the New World Telegram review of a 1938 Fifteen Gallery group show, Stevenson was "the liveliest and least conventional member of the group, contributing several prints and drawings marked by vivid almost busy angular patterns." 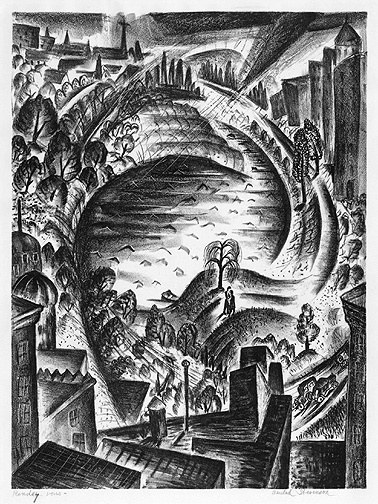 The Evening Post commented on the lithographs in a 1931 solo show as "a medium in which the artist is at home and expresses a delightful version of the subjects which she depicts . . . There is a witty note in them all, a rich vein of personal expression which is pleasant to encounter." 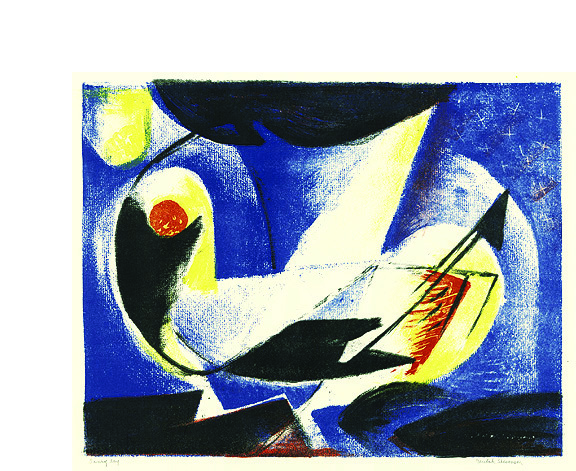 Stevenson's fusion of realism and abstraction was progressively modernist for its time, causing critics to remark on her "objective abstraction" and the manner in which she "looks to nature for her impetus, but prefers to record its essence more than its actuality" (Herald Tribune, January 16, 1938). Although her work clearly presents a cubist vernacular in its dissolution and juxtaposition of forms, the underlying structure of her images retains a faithfulness to literal representation. The vitality of this union of styles and Stevenson's perpetually optomistic outlook brought her popular success as well as recognition from her peers. Critics described her as "an experimenter in originality" and a "Happy Modernist." Image size 16 3/4 x 12 7/8 inches (425 x 330 mm). A fine, rich impression, with full margins (1 1/8 to 2 inches), on cream wove paper, in excellent condition. Five Houses Thru the Door- - c.1940, Color Lithograph. Image size 12 15/16 x 8 15/16 inches (329 x 227 mm); sheet size 20 x 13 inches (508 x 330 mm). A fine, fresh impression, with full margins (1 7/8 to 4 1/4 inches), on cream wove paper.Tape stains in the left and right sheet edges, recto, well away from the image, otherwise in excellent condition. Printed in sienna brown, slate blue and yellow ochre. 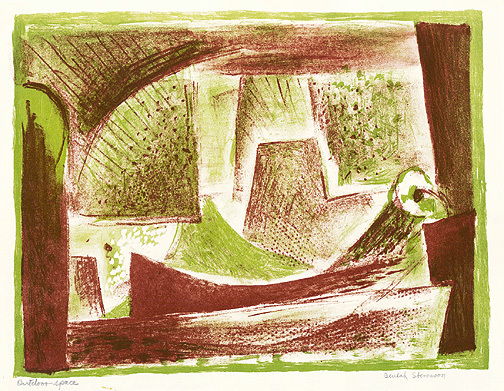 Rendez Vous- - c.1945, Lithograph. Image size 15 15/16 x 11 7/8 inches (405 x 302 mm); sheet size 21 7/8 x 17 7/16 inches (556 x 443 mm). A fine, rich impression, with wide margins (2 1/2 to 3 1/4 inches), on off-white wove paper, in excellent condition. Mountains Near Santa Fe, c.1949, Color Lithograph. Image size 9 3/8 x 12 1/8 inches (238 x 308 mm); sheet size 12 7/8 x 14 7/16 inches (327 x 367 mm). A fine, fresh impression, with full margins (1 to 2 1/8 inches), on off-white wove paper. Tape stains in the left and right sheet edges, well away from the image, otherwise in excellent condition. Printed in Lime yellow, crimson red and black. Outdoor Space- - c.1952, Color Lithograph. Image size 9 3/4 x 12 3/4 inches (248 x 324 mm); sheet size 11 7/16 x 16 inches (291 x 406 mm). A fine, fresh impression, with full margins (5/8 to 1 3/4 inches), on off-white wove paper. Tape stains in the sheet edges, recto, well away from the image, otherwise in excellent condition. Printed in yellow and black. 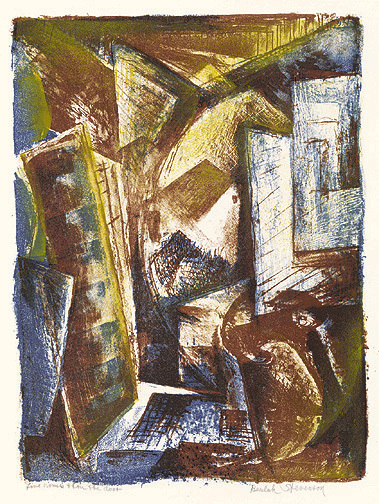 Outdoor Space, c.1952, Color Lithograph. Image size 9 3/4 x 12 3/4 inches (248 x 324 mm); sheet size 11 3/8 x 15 7/8 inches (289 x 403 mm). A fine, fresh impression, with full margins (5/8 to 1 3/4 inches), on off-white wove paper. Tape stains in the sheet edges, recto, well away from the image, otherwise in excellent condition. Printed in burgundy and lime green. Provincetown Bay- - c.1952, Color Lithograph. Edition 10. Signed, titled and numbered 5/10 in pencil. Image size 9 x 11 7/8 inches (228 x 302 mm); sheet size 10 11/16 x 14 1/2 inches (271 x 368 mm). A fine, fresh impression, with full margins (3/4 to 2 1/8 inches), on off-white wove paper, in excellent condition. Printed in Cophenhagen blue and raw umber. 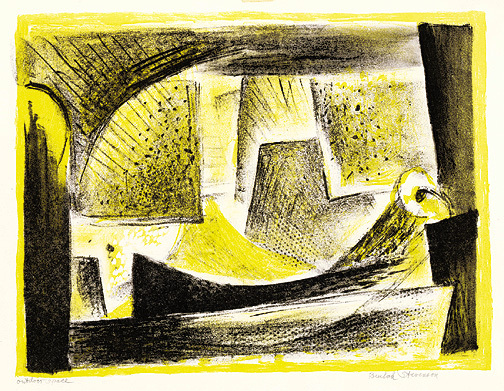 Sunny Day- - c.1953, Color Lithograph. Edition 10. Signed and titled in pencil. Image size 12 1/8 x 15 3/8 inches (308 x 391 mm); sheet size 14 3/4 x 18 7/8 inches (375 x 479 mm). A fine, fresh impression, with full margins (1 1/4 to 1 5/8 inches), on cream wove paper. Slight tape stains in the sheet edges, otherwise in excellent condition. Printed in scarlet lake, Copenhagen blue, cannary yellow and black.